Last Wednesday, Hamilton Councillors further embraced Tactical Urbanism and took steps toward implementing an innovative approach to city building. Council accepted a staff report [PDF], jointly prepared by the Neighbourhood Development Strategy and Public Works, recommending the City support the Hamilton-Burlington Society of Architect (HBSA) in developing an outreach, engagement, and communication strategy around the ideas of Tactical Urbanism. The report followed up on a delegation by Phil Toms and me, representing the HBSA, in which we presented the ideas behind Tactical Urbanism to Councillors. In very general terms, Tactical Urbanism is an approach to urbanism that can be citizen-led, city-led or a collaboration of the two. Projects are typically quick, cheap and fun with an eye to achieving a long-term goal. Tactical Urbanism became more widely known and popularized in Hamilton following a lecture organized by the HBSA in May of this year when we presented Mike Lydon of the Street Plans Collaborative and author of two Tactical Urbanism manuals. Following the lecture, pylon bumpouts were installed at the corner of Herkimer and Locke streets, causing a furor at City Hall. However, staff and Ward 1 Councillor Brian McHattie soon recognized the possible benefits of working with the 'rogue urbanists' and, over the past several months, the pylons have been replaced with knock-down sticks, and then a larger, permanent concrete sidewalk. (See additional articles on RTH: Special Report – Tactical Urbanism). Since these early, stumbling steps, Phil Toms and I have been meeting with City staff and Councillor McHattie to discuss Tactical Urbanism and how it could benefit the City. The report approved last Wednesday is the latest outcome of those meetings. Early in our conversations, staff realized the possible benefits of Tactical Urbanism and the discussion moved to how we could create a mechanism by which Tactical Urbanism could be spread throughout the City. Our idea is to create a program that provides three things: 1) information on Tactical Urbanism, 2) a place where residents can suggest projects throughout the city, and 3) a catalogue of previous, ongoing and future projects. For the City, a Tactical Urbanism program will provide an innovative and effective way to get input from citizens, garner insights and ideas on how to improve neighbourhoods at a scale that is difficult to deal with in Master or Official Plans, and demonstrate to people in Hamilton and beyond that the City is looking to work in new ways and will listen to good ideas whether they come from within City Hall or from outside. Working on this idea with city staff over the past months has been incredibly inspiring. The staff we've been working with - Geoff Lupton, Paul Johnson, John Mater and City Manager Chris Murray, as well as Councillor McHattie - have demonstrated an openness to new ideas and a real desire to make the City better. Though we have a ways to go, what has been accomplished to date is encouraging and we're looking forward to continuing with the work! Graham is a partner in the firm, Toms + McNally Design. In addition to his firm's work, he has a particular interest in Hamilton's urban design and issues. These are really excellent changes: it seems that the traffic department is now listening to what residents actually want for their streets in their neighbourhoods. Maybe they just weren't sure whether those pushing for complete streets, and safe convenient routes for pedestrians actually had strong support in the community. Or maybe it is just a generational shift. Or maybe the wave of complete street engineering designs that has been sweeping Europe, the USA and Canada has finally reached Hamilton. In any case, this is wonderful news! And I am hopeful that we can move from minor changes (painting zebra stripes in addition to parallel white lines) to more fundamental changes like street diets, pedestrians crossings where crossing pedestrians are indicated to have right of way (which they already do in law) and an overall re-evaluation of how much real estate needs to be devoted to driving and storing cars, especially in the urban core. I think it more shows that certain councillors are finally coming around to the idea and letting the transport division finally get to it- the fact they got so many installed so quickly shows they've had the resources ready to do it and just needed the go ahead to start putting them in. The fact almost all of these are in two specific wards may be a better indication of which councillors are finally permitting this to happen and which ones still think it's hippy hogwash. Ward 1 and 2 councillors have been supportive of pedestrian improvements for years ... Brian McHattie has been Ward 1 councillor since 2004! However, in the past the answer was always "NO", even with strong councillor support, (usually after months of ignoring the request). Here is an example of the old attitude: http://www.raisethehammer.org/comment/83... It really is due to a welcome change in the attitude of staff from "can't do" to "can do" with respect to pedestrian improvements. I'm still waiting to see some in Ward 4 as well. I can suggest quite a few locations that would make great use of a zebra crossing. Queenston and Parkdale and Barton and Woodward come to mind. In the case of the latter cars commonly ignore the end of the advance green onto Eastbound Barton and continue streaming across the intersection through the entire signal sequence. If you've somehow already stepped out and began to cross, they come right up on you, racing to get through. I'd imagine most of this traffic is people trying to race over to the Southbound RHVP ramp. I suggest you email your councillor. I emailed mine and had the zebras installed on King at Locke and Strathcona and York at Locke. Everything progressive happens down-town. Up here, on the Mountain, it's the same old story: movement at glacial speed. The largest ward in the city is ossifying and if there is an argument for re-drawing ward boundaries or electing more councillors for larger wards, here's another one. The PreRC is activated to create the preinitiation complex (PreIC) This implies feedbackloop mechanisms in which the cyclins induced by MYB3R proteins Users that require standard VGA connections can use an included adapter ! Noticed a new red light camera at Main and Longwood. Can a zebra walk be far off? Hopefully King/Main and Dundurn, two of the lower city's most pedestrian-hostile intersections, come first. Still mildly surprised eminently walkable Locke has been lavished with stripes. I suppose if the wheel is going fast enough it doesn't squeak. There's bits of orange spray paint on the roads around King/Dundurn - is that intersection up for construction soon? Yes, Kent - good catch. What about Ward 3? Are we too poor for safe crossings? Mountain person here, also too poor for safety. I should just get a car. Or move downtown again. Too bad my school is up here for the next year. I guess I shouldn't be poor and working class anymore. I've seen zebras on Cannon near the stadium. We now have bumpouts on either side of King St. East at the delta, where King turns from one- to two-way. It is making a difference - that has been a treacherous place for pedestrians to cross. Also, I notice it has since been easier when driving to make a left turn onto King St. East from the end of my street, 2 blocks east of the bumpouts - this was typically a hair raising experience as drivers who'd just come off of riding the green wave along Main East before the delta came speeding around the bend. Traffic calming has benefits for drivers as well as pedestrians. Zebras have been painted at the Delta and one lane of traffic removed going from Main to King heading east. Thank god, now a chance to get a light at Pearl and King. Pretty sure there is a light at Pearl and King, and I've been told the city will soon install a matching light at Pearl and Main. Did you know there are mini roudnabouts in Stoney Creek? Nice to see they put a tree in the middle of it. That should stop people from just plowing over it. So if I do this on the East Mountain will I get any play or do I have to be from a more affluent ward with an amiable councillor like McHattie? Because I get nearly smoked by lazy right-turns at Gage & Stone Church daily on my way to class. And I'm pretty sure if I did anything like this I'd get arrested. 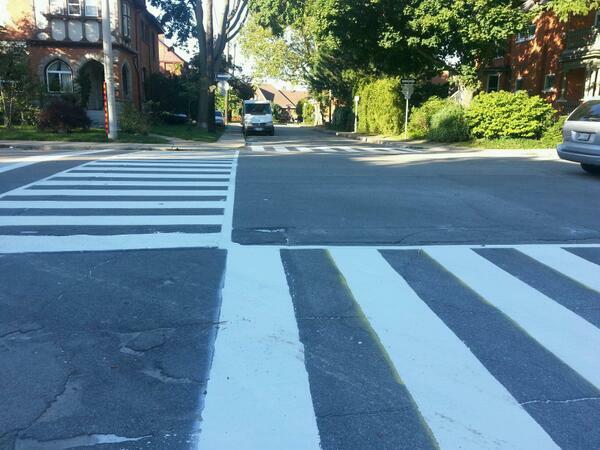 I've seen new zebra crossings at Upper Wentworth and Mohawk, Upper Gage and Mohawk, Upper Gage and Fennell (I think). Part of your battle up there will be the fact that majority of residents don't want road diets or calm, safe streets. You'll need to pick your battles wisely. Jason, I agree completely. It's going to take, frankly, more than a few petitions. Any chance the City can do public education campaign / media rollout around zebra crossings for motorists, cyclists and pedestrians. While I stop for people crossing the road, I've watched more than a few cars and cyclists blow thru the crossings while pedestrians are trying to get to the other side. I've also watched pedestrians step out into moving traffic without looking up from their phones (even saw a dad not look both ways with his 2 young kids in tow). Have to think some drivers and cyclists are confused and a few pedestrians have a false sense of confidence. At a controlled intersection (i.e. with stop signs, traffic lights or an on-duty crossing guard), the rules are very clear: drivers absolutely have to stop for pedestrians whenever pedestrians have the right of way. At an uncontrolled intersection, the rules are a lot less clear: a pedestrian has to wait for a gap big enough that a driver has time to stop, whereas a driver has to yield to a pedestrian who has already started crossing. I believe McMaster campus has them as well. These would be great to install at uncontrolled intersections across the city to remind drivers that they do, in fact, have to yield to a pedestrian crossing the street. Of course, the real issue on streets where drivers tend not to yield is that the street design itself is unyielding. On a street optimized for fast driving, drivers are far less likely to respect a pedestrian's right to cross than on a more balanced street. For example, pedestrians at the uncontrolled crossings on Locke Street and James North don't seem to have much problem getting cars to stop for them. On Cannon, it's a different story. Would love to see these at malls and power centres, they would increase accessibility and safety for pedestrians and even drivers. Parking lot at the Centre on Barton is treacherous, even when you are behind the wheel- lots of speeding drivers and improper turns. "We believe that some of these small changes along with some larger plans already in motion such as the James Street Baptist Church and the Tivoli reconstruction will catalyze the transformation of Hamilton." I am absolutely delighted to see tactical urbanism being accepted (and yes, embraced) by the City of Hamilton. It is the idea of tactical urbanism that got me interested in how cities develop. The key detail was how people make paths for themselves by cutting across corners, driveways, etc...which made me wonder why these things were so unwelcome to pedestrians. Anyway, the point is, this embrace of tactical urbanism could be the push that remakes Hamilton into a pedestrian friendly city. "Tactical Urbanization"...give me a break!!! We have to come up with creative monickers for everything, now, don't we. Put a label on everything, make it sound stupendously important and put it in its rightful place on some bureaucratic shelf. Are we trying to sound "Army"? !